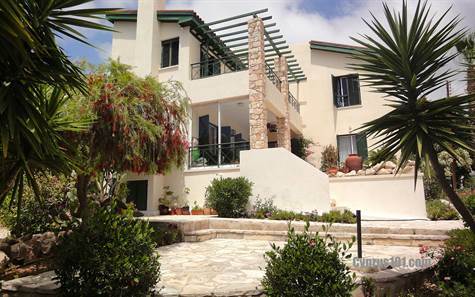 Peyia, Paphos - This spacious 3 bedroom detached villa is situated in a quiet residential area in the sought after location of Lower Peyia. Coral Bay known for it’s sandy beaches and crystal clear waters is a few minute’s drive away. The ground floor features a light and airy entrance hall with cloakroom and staircase to the right. Straight ahead is a stylish lounge with feature stone fireplace and patio windows opening on to a wide covered veranda. Along the hallway is an archway to a beautifully fitted quality kitchen and beyond this, a separate dining room, also with direct access to the outside. Upstairs there are three double size bedrooms and a family size bathroom accessed directly from the landing and upper hallway. The master bedroom has an amazing unique en-suite shower room with fitted vanity unit and cupboards and a feature stand alone shower cubicle. A large covered veranda with fantastic sea views can be accessed directly from the master bedroom, second bedroom and from the hallway also. The property sits in a sizeable plot of 780sqm which is largely landscaped with a wonderful variety of colourful, local plants. The covered veranda at ground level overlooks a lower terrace and the beautiful gardens below where there is space for a swimming pool if required. Ideal as a permanent residence or holiday home, this property is full of character with wood and stone features and unique kitchen and bathroom designs. An added bonus is a purpose built utility room adjoining a tiled roof car port. Furniture can be included if required and there are full title deeds. Please refer to MLS: 1395 when inquiring.